One Page Wednesday is a series hosted by Natalie Serber. An opportunity to share or listen to one page of work in progress from talented Portland writers. Kate Carrol De Gutes lives in Portland in a house with lots of light, wood floors, and a view of the best bridge in the city. 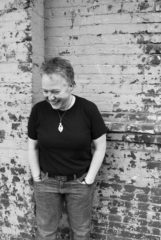 In the evenings, she sits at her great-grandparents’ quarter-sawn oak table and writes long-hand about grief, the drama of dating at midlife, riding bikes, and the joys and challenges of authentic living. Also, she apparently uses a lot of compound nouns. She’s the author of Objects In the Mirror Are Closer Than They Appear, a 2017 Oregon Book Award winner, and The Authenticity Experiment. 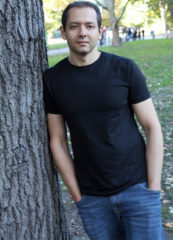 Omar El Akkad is the author of the debut novel, American War, a 2018 Oregon Book Award winner. He has covered some of the biggest stories of the past decade, including the Arab Spring revolutions, the Black Lives Matter movement and the repercussions of the war on terror. He is the recipient of Canada’s National Newspaper Award for investigative reporting.